Do you know how to declutter? Check out that closet up there. Does your closet look like that? Full disclosure - that is not my closet. If there is anyone out there who has a closet that looks like this - please tell me how you did it. You are miraculous!! I decided to write a piece on decluttering after I read everyone’s goals for the New Year. So many of you wanted to organize your closets, or declutter, or purge the junk. Please feel free to add your 2019 goals to that post if you haven’t done so. I think that this is very interesting as it has to do with health. Do you feel relaxed, unencumbered, and full of life? or do you feel stressed, weighed down, and overwhelmed? How do your possessions make you feel? We have discussed weight as it relates to waist line but what about weight as it relates to how heavy your home is with all your stuff. My house definitely weighs too much. What to do? You could get one of these and just toss everything in it that you no longer use. That would be the simplest solution but not so great for the environment or your pocket book. 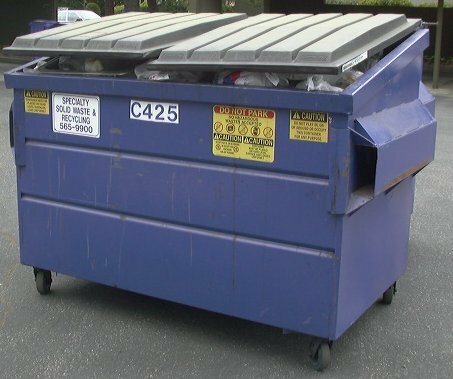 But, I show the photo of the dumpster because that is where many of our things end up when we die. 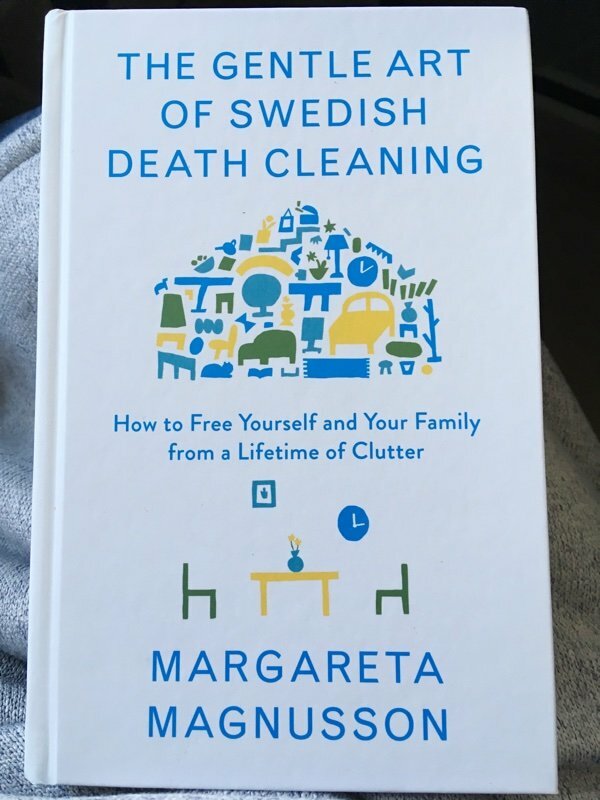 This book, The Gentle Art of Swedish Death Cleaning by Margareta Magnusson is a best seller. Why? Well, she tries to get you to think about your stuff as a burden for your loved ones once you are gone. It is a very different perspective than I have read before about our material things. 1. Take a look around. Does anyone want this stuff? Do you want this stuff? If you don’t want it, give it to someone who does or give it away. Surround yourself with the least amount of wonderful stuff. 2. Photos, letters, and things laden with memories are very hard to part with. Organize them and put them in a special box. Keep the best stuff. 3. Clean out your home before you die so no one is stuck with the job. Giving away things to people who will appreciate them feels really good. I had a piece of artwork that I no longer enjoyed. Someone told me how much she liked it, and I took it off the wall and handed it to her. Now, I have something else up that I like much more and she is happy too!! Win, win. I’m not so sure that this book deals with the mess of every day life but she gets to the heart of the piles of stuff in your closets, basement, garage, and attic. Don’t hold onto it if you aren’t using it. 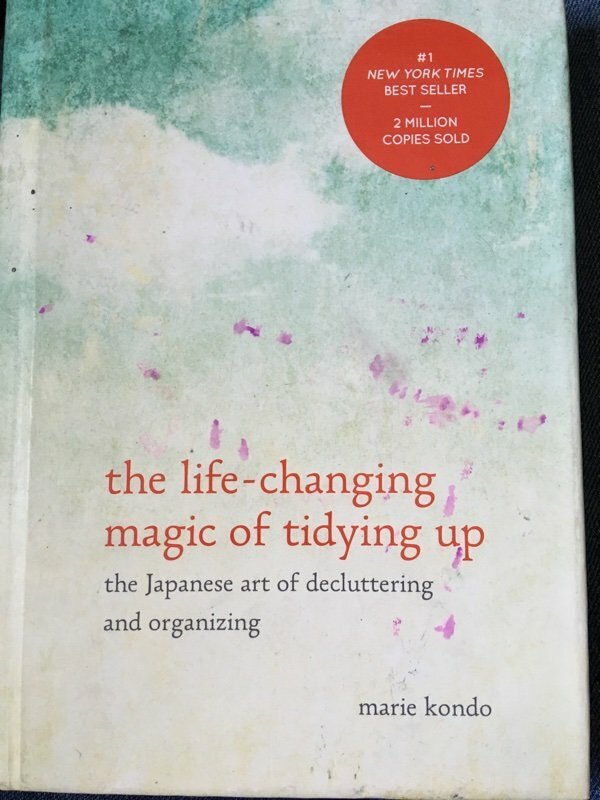 Marie Kondo author of the life-changing magic of tidying up has her own Netflix series. Now, you don’t have to read her book to see her in action (if you have a Netflix subscription). The show has Marie show up (like Mary Poppins) and fix the messy, cluttered household so there are systems in place that make life easier. Marie, if you are reading this, my house is perfect for your show!!! Watch it and you may get inspired (or you may curl up into a little ball and give up) - could go either way. 2. Toss, sell, or giveaway things that don’t bring you joy. 3. You don’t need a ton of stuff. I used the “joy” method on my clothing and got rid of 5 bags of clothes. I can fit everything into my drawers and closet that I use. I haven’t been able to bring myself to clear out my books in a while but I gotta get on it! Here are some strategies that are working for me on the fight to keep my house free of mess and stuffed closets. 1. Before I buy ANYTHING, it must have a place to be stored. If that means I get rid of something to fit it in my house then so be it. 2. Do not buy more than I need. Spending money on experiences is much more valuable to me. I will choose a massage over another coat (I have 3) any day of the week. 3. Choose doable small areas of the house - put them on my “To Do” list - and get them organized. It may be a slow process but it works. I find that breaking my house into sections is helpful. Obviously, how you choose to declutter will be very personal to you. Sometimes the best strategy is to invite a good friend over for some wine and cheese and ask them to spend 30 minutes with you on your closet. It is amazing how a different perspective can help you get it done. Please share your decluttering strategies. Let’s help each other lose the weight in our homes. Super post! Makes me wonder where we get the desire to hang on to everything and to fill empty all empty spaces. In my town we have a free giveaway website and every time I use it to get rid of something no longer needed I am thrilled to see how happy my «thing » makes someone, Fun. Hi Lisa - what a coincidence!! Immediatly before I signed on to read your email, I had just finished clearing out my linen cupboard. It had held lots of non- linen stuff - half used creams, makeup and anything else I couldn't find room for. As a result, most of my linens were all stuffed into whatever space was left or still sitting around the place because I couldn't fit them in. Two black garbage bags and an hour or so, I have now opened the cupboard door twice and am admiring the results as I write to tell you what a relief it brings to see it done and I'm giving myself a pat on the back for doing it. Although I didn't read your post until after, your words added to my sense of accomplishment and I thank you for that! Always great to read about decluttering - I used to be darn close to being on Hoarders. I take pictures of things I want the memories for. I always gave things to various charities, and now that I volunteer at a thrift store I do it more often, knowing that there is such a varied network of thrift stores that if I give away something then wish I had the item again, I can often find at another thrift store. I replace something I like in my house with something I love from a thrift store, and help the charities by buying items AND provinfing others they can sell. Habitat for Humanity Re-Stores are great for household items and building materials, so it’s easier than ever to donate. For most thrift stores, read their rules on what they accept before you go, and please don’t fonate something that is trash, broken, soiled, covered in animal hair. They mostly rely on volunteers, they don’t typically wash clothes before selling, and have to dispose of trash that is donated. But charities are most grateful for your donations! Wow! Great post. Our stuff truly does weigh us down. A year ago my sister passed away suddenly and I had to deal with not only the loss of my lifetime best friend but also getting rid of her possessions. 2018 was the most stressful year of my life but it also taught me many life lessons. One being, don’t keep accumulating more stuff! My husband and I have started the process of purging stuff that we have been sitting on. It is a daunting process for sure but very liberating! We also think twice before, for example, a trip to Brimfield, for more stuff! “Shop” what you have and get rid of the rest. Thanks again for all you do. Really appreciate your posts! Oh did I ever need this! I have Marie's book on my shelf😔but will began to read it NOW! Thanks for bringing this topic to my attention. Think I have been purposely avoiding although I knew I needed to get started. Thanks, Lisa, for this timely topic. The beginning of a New Year is a very good time to start organizing and decluttering. I also highly recommend Dana K. White's decluttering books and blog ("A Slob Comes Clean"). Dana talks a lot about the "container concept": You have to look at your closets, bookcases, cabinets, rooms, etc.--your entire house--as containers. A container has a size limit; you can only keep what fits comfortably in that container. Her advice has really helped me in my decluttering process. Less is more! Happy New Year! Thank you Lisa for this post. Several years ago I made a resolution not to buy any more books, but to rely on public libraries. My bank account thanked me! Now, I gift my books to others - gift exchange, white elephant exchange at work, friend recuperating from surgery, simply wanting to give someone something meaningful....they all get books! It seems more personal to me than selling to a second-hand book store or donating - I know where these gems are going. PLEASE DON'T FILL UP THE LANDFILLS WITH YOUR UNWANTED ITEMS: Use Freecycle.org, Facebook garage sales, Nextdoor.org free stuff, Craigslist free stuff, Goodwill, Salvation Army, area churches, area schools, battered women's shelters, homeless shelters, friends or neighbors who could use your stuff. Take a pledge to not put anything in the garbage that could be used by someone. Trade your unwanted stuff for help sorting it out. You own it, you are responsible for responsible disposal of stuff you have acquired. This is a fantastic article. After cleaning out my parents home after they passed away, we have started decluttering our own house. My mantra has been that we will not do to our children what my parents did to me. 5 years after my mother's passing, I'm finally down to the photos. We gave away what we could, had a garage sale, donated to various organizations, and shredded anything with their name or address on it. If there is one thing I could say to everyone, please go through your photos and write on the back who is in the picture. That would have been so helpful if my parents had done that. My sister and I just yesterday talked about de-cluttering. She has Netflix and had been watching Marie Kondo . I haven’t seen show but I thought Okay I can do it. I spent the morning on my dresser and closets (must buy more clothes so much room NOT). Then went through magazines and recipes I had great plans of making. Recycle bin is filling house is emptying. Now how to get hubby to work on his. Wonder if there is a book on that hmm. Timely column! These tricks work for me: I give myself 10 minutes and tell myself I will work on the task for just 10 minutes. Usually I'm at it for much longer, but gets me going. Thanks for the extra boost of motivation. I have found getting rid of stuff the hardest process ever. I still have mine and my husbands parents stuff and our own stuff lingering in my house. It's the emotional attachments that make getting rid of things so difficult. It is baby steps with me but I am keeping the faith and keep on going. Last year I must have purged hundreds of pounds of stuff in all sorts of ways, flea markets to support my son's singing group, GreenDrop and giving things to people who I know may appreciate them. As well as just recycling or throwing things away. Another quick tips, I use putting holiday decorations away as an opportunity to purge items. An update to my previous post - Lisa it looks as if you and the universe are in cahoots to get me to declutter. The last line in today's horoscope (I'm a Scoro) - "get rid of any unnecessary clutter". I don't believe in coincidence! Don't throw away mascara wands. Clean them and send to Wands for Wildlife. Thanks. Let it go by Peter Walsh was a big help to me. He addresses those sentimental things you want to keep but just collect dust. I like his approach. Moving across the country is a major way to declutter. Having half the space for stuff forces you to keep what’s really important. And not having closets stuffed to overflowing lets you see what you’ve got. 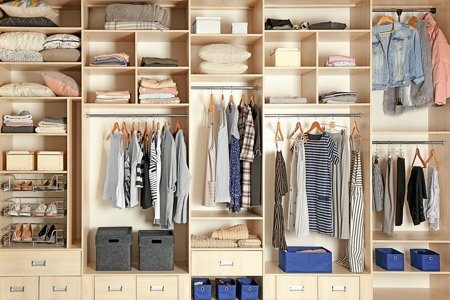 Like clothes you never wear, getting rid of them frees up space so you can see what you have at a glance. It’s a constant job just like housework, it never really completed! Susan McAuliffe I do the same thing! I get home, pull out the important stuff and put the junk aside for when I have time to look at it (which is never) I am now training myself to put junk mail direct into my recycle bin. I have read Marie’s books and they are a bit over the top, but they have helped me say “good bye” to many things I found myself holding onto. I recently downsized from 2400 foot home with basement and walk-in closets, to a 1200 foot 2 bedroom condo with old fashioned 6’ sliding door closets. I took office clothes and in used costume jewelry to a homeless center for women who are job hunting. I also brought them bed linens and blankets, toys my grandkids no longer play with. The same shelter has a thrift store in my town and I donated everything else. I just learned there is a church who gives clothing to the homeless and I will be bringing things there. I also belong to a few Facebook groups where I’ve sold things. There are a lot of great ideas in this post - keep them coming! I really Love your Daily E-mails, especially this one. I've learned that libraries are not only happy to take old books, but they also love craft supplies. Also, hospitals will take magazines and books. I look forward to reading your posts Snack-Girl, but this one takes the cake! Keep 'em coming! Just read your article. It really hits home with me. I'm not a hoarder, I just hate housecleaning, so "stuff" builds up anyway. Suggestion: instead of having a gift exchange, or an Amazon wish list or whatever, ask your daughter, sister, friend or whoever to donate a Saturday or a weekend to help you clear out your kitchen or bedroom or closet and get things in order. They can help keep you on track, do some of the grunt work and keep you company all at the same time. After that it's more a matter of maintaining than of cleaning, or clearing out. Also you don't get junk that you don't really want, but is given to you because it's expected. I've done this a couple of times, and I really appreciate the help...not to mention the cleared out space.